When to get a CT prior to LP? The data on this is extremely poor and is based mainly on case series of herniation occurring after LP in patients with increased ICP. One study showed that the physician’s clinical impression had the highest predictive value in identifying patients with a contraindication to LP. The take home point from all of this seems to be to get imaging if you suspect increased ICP. Lateral Decubitus position allows for immediate measurement of opening pressure without patient repositioning. As you advance the needle, the feel of the tissues should be like you are pushing the needle through clay - it'll offer some resistance, there may be some 'grittiness,' but it should not completely halt your progress. Can also measure closing pressure after fluid removal for treatment of Idiopathic Intracranial Hypertension. This is one of the most important and overlooked part of the LP. Positioning the patient properly is pivotal to increasing the success rate of the procedure. Increasing the interspinous distance allows for a larger space for the spinal needle to enter. To increase this distance, the patient needs to flex their lumbar spine as much as possible. One way of assisting this is to support the patient’s feet on a stool (See Image 2 below). One study showed that this maneuver increased the interspinous distance by 1.1 mm. If you are positioning your patient in the lateral decubitus position, the same principles hold true. Flexion of the lumbar spine will help to increase the interspinous distance, allowing more space for the spinal needle to enter. This is accomplished by having the patient in a fetal position with their knees touching their chest. When getting into this position, it is naturally more comfortable for patients to slightly roll one of their shoulders more forward. Doing this causes a subtle rotation in the spine and can make external landmarks more difficult to appreciate (See Image 3 below). 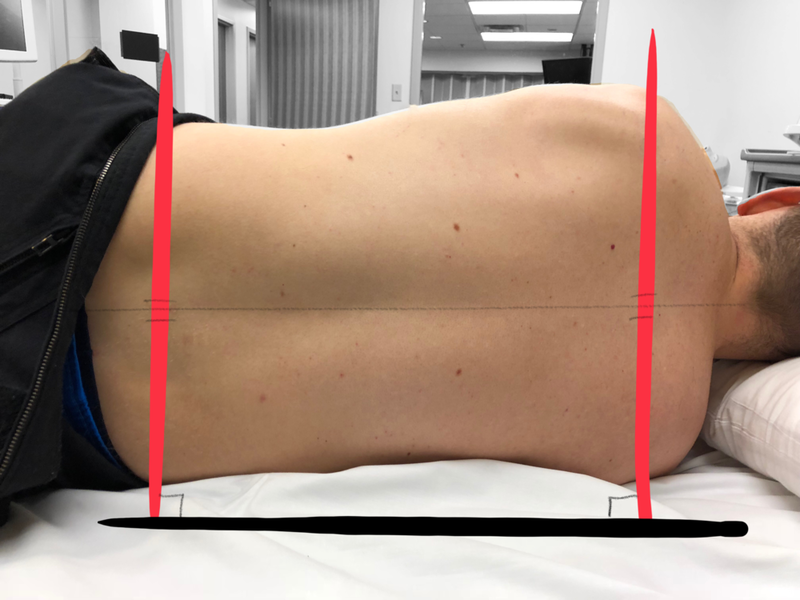 The goal of the lateral decubitus position is to have the shoulders and hips be parallel to one another and to be perpendicular to the surface of the bed (See Image 4 below). It is important to remember, however, that if you are measuring opening pressure the patient’s must straighten their legs. Measuring pressure in hip flexion can artificially raise pressures. As mentioned above, the 'feel' of the needle advancing through the subcutaneous tissue and interspinous ligaments and tissues is similar to passing a needle through clay. Discernible "pops" as you pass through the ligaments are quite uncommon. You may feel some 'grittiness' as the needle is advanced but it should not offer complete resistance to your forward progress. If you encounter complete resistance, you need to reposition. If you are sure of your insertion site and sure that you are in the midline, as long as you feel the "clay-like" text of the tissues, continue to advance. Lumbar punctures can be maddening procedures. Sometimes patient's with seemingly "easy" anatomy end up being exceptionally difficult. Knowing how to troubleshoot is key to the mastery of this procedure. Euerel, Brian. Spinal Puncture and Cerebrospinal Fluid Examination. Chapter 61. Roberts and Hedges, 6th edition. 1107-1127. Doherty CM, Forbes RB. Diagnostic Lumbar Puncture. The Ulster Medical Journal. 2014;83(2):93-102. Sandoval M, Shestak W, Stürmann K, Hsu C. Optimal patient position for lumbar puncture, measured by ultrasonography. Emerg Radiol. 2004 Feb;10(4):179-81. Epub 2003 Nov 15. Robbins E, Hauser SL. Technique of Lumbar Puncture. In: Kasper D, Fauci A, Hauser S, Longo D, Jameson J, Loscalzo J. eds. Harrison's Principles of Internal Medicine, 19e. New York, NY: McGraw-Hill; 2015. Ladde JG. Central Nervous System Procedures and Devices. In: Tintinalli JE, Stapczynski J, Ma O, Yealy DM, Meckler GD, Cline DM. eds. Tintinalli’s Emergency Medicine: A Comprehensive Study Guide, 8e. New York, NY: McGraw-Hill; 2016. Authored by Timothy Murphy, MD, Jeffery Hill, MD MEd.